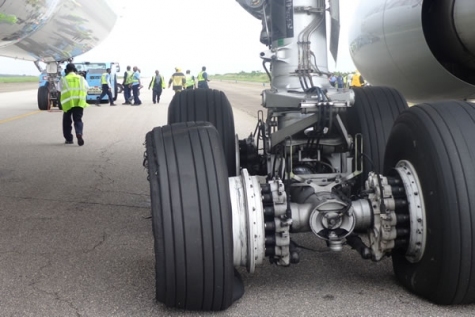 A Qatar Airways flight from Doha safely made an emergency landing in Nigeria’s economic capital Lagos after encountering a problem with one of its tyres, the civil aviation body said. The aircraft landed at the cargo terminal of Murtala Mohammed International Airport on Saturday and was then towed to an area where passengers were able to disembark, officials said. Qatar Airways flight QR592 was travelling the regular Doha-Lagos route and reported the tyre problem to Nigerian airport authorities, said Demuren, who identified the aircraft as an Airbus A330. He said no passengers were injured during the emergency landing and that one of the plane’s tyres had to be replaced. A mechanic at the airport said one of the plane’s left tyres was flat. Three passengers who were on board said that the crew had made no announcements about a mechanical problem during the flight. “They landed safely. There was no problem. I didn’t notice any other thing,” said Raphael Ashala, 30, a Nigerian who was on his way back from a Doha business trip. Emergency vehicles including fire trucks were on hand for the landing, the AFP news agency reported. The airline’s online tracker said the flight arrived in Lagos at 2:29pm (13:29 GMT), but the plane touched down at least 30 minutes before that. The website made no mention of any incidents during the journey, saying only that flight QR592 had “arrived”. In June, a McDonnell Douglas-83 operated by Dana Air plunged into a neighbourhood near Lagos airport after reportedly suffering double engine failure. The crash killed all 153 passenger and crew as well as at least six people on the ground.